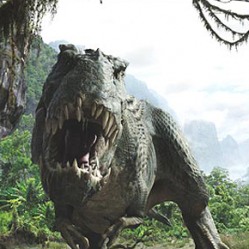 The Tyrannosaurus or T. Rex existed in the late cretaceous period some 65 million years ago. A carnivorous dinosaur and an extremely popular icon in todays movie culture this dinosaur is probably one of the most talked and read about dinosaurs ever to have existed. With some amazing scenes in both Jurassic Park and the recent King Kong movie it’s no wonder he’s so popular. The name Tyrannosaurus Rex means ‘Tyrant Lizard King’ which stems from the Greek word ‘tyranno’ meaning tyrant, ‘saurus’ meaning lizard and ‘rex’ meaning king. The grand name comes directly from the fact that the T. Rex was most probably one of the largest and most terrifying carnivores of its time. The Tyrannosaurus a bipedal theropod was a part of the Tyrannosaurid family which existed in most parts of western north America as well as some parts of Asia. For a long time it was believed that the T. Rex was the largest carnivorous dinosaur of them all, but that was before the Giganotosaurus and Carcharodontosaurus were discovered. Despite not being the largest of the carnivores it was still the largest member of the Tyrannosaurid family and of course recognised as one of the fiercest land predators ever to exist. Over time scientists have classified and re-classified discoveries in and out of this group as quite clearly the tyrannosaurid group is a bench mark in its own right. As an example in 1955 Russian paleontologist Evgeny Maleev named a new species called Tyrannosaurus bataar which was discovered in Mongolia. By 1965 this species had been regrouped adn renamed to Tarbosaurus bataar. Despite the renaming it’s still thought of being a close sister and asian version of the Tyrannosaurus rex. At over 20 ft tall, 40 ft long and weighing up to 8 tonnes the Tyrannosaurus was longer than the width of a tennis court, heavier than an african bull elephant and tall enough to look into an upstairs window. It’s massive legs bore its weight on three large, bird like clawed toes, whilst its arms which despite being extremely short were strong and powerful with 2 clawed digits. One feature that stood out in all Tyrannosaurids was the size of their skull. In simple words it was huge and at 5ft long the skull was almost half as long as the backbone between the hips and the head. The head was basically the size of a small car and considered huge even for dinosaurs. To support such a large head the T. Rex had an extremely short but muscular neck giving it extra strength and allowing it to stabilise the head as it moved. Obviously a huge skull meant plenty of room for large teeth which were so hard that they were known to penetrate even bone. All these characteristics meant that the Tyrannosaurus Rex had one the strongest bite forces of any dinosaur that ever existed. The pressure exerted in a single bite was equivalent to around 4 tonnes per square inch. Obviously with such a mean bite teeth are bound to be lost which luckily for the T. Rex and the rest of the tyrannosaurid family grew back throughout its life. The T. Rex had a small brain in proportion to its body, but even so it was larger than most other dinosaurs. Its eyes were positioned on the front of the skull which is very similar to the way human eyes are positioned, and would have meant its ability to focus and judge distance objects was very good. Scientists also believe that a large portion of the brain was allocated to smelling making the T. Rex a very strong sniffer. If you combine the strength of the eyes with the strong sense of smell you very quickly appreciate how these two natural abilities would have made the Tyrannosaurus a very effective predator. As well as a large head the Tyrannosaurus also possessed an equally large and stiff tail. Most scientists believed the weight of the tail would have meant it dragged on the floor as it moved, however more recent studies challenged this stating that the tails weight formed a counter balance to the extremely heavy head. If this were the case then it would actually be carried in the air to counter the heavy head which would have been in a forward leaning position. Despite having arms that were only 2-3 ft long they were still however extremely muscular and able to support hundreds of pounds of weight. So what were these arms used for ? Well a number of theories are plausible and one of them is that the arms were used to assist the T. Rex whilst lifting itself off the floor. Others say that the two sharp claws on each arm were used to hold its prey whilst it devoured them with its mouth. When we start to talk about the Tyrannosaurus and its huge head it’s very easy to forget what it’s overall size was in comparison to the long necked sauropod herbivores. Some examples include the Sauroposeidon which is the tallest known dinosaur and stood at 55 ft (17 metres) in height, the T-Rex as you can see was almost a third of its height. In fact there were even larger sauropods such as the Argentinasaurus who was 115 ft long (35 metres) and weighing between 80-100 tonnes. Compare that to the T. Rex which was only 6-8 tonnes and 40 ft in length and you quickly realise the size difference. We throw this section in because most readers get so amazed with the grandness and power of the T. Rex that they often forget his overall size in comparison with the rest of the dinosaurs. The Tyrannosaurus Rex had one of the strongest not to mention longest legs of any Theropod. These massive legs combined with three huge toes on each foot meant the T. Rex was able to take very long strides covering distances of up to 15 ft with each step, thus giving it a top speed of around 25 mph. It’s thought that the T. Rex probably lived close to its prey which were in most cases plant eating herbivores. This would imply that its primary dwelling would have been near forests, open woodland, rivers and valleys rich in plant life. We know the T. Rex was probably well suited to hunting but how it hunted is an issue up for debate. Most scientists feel that due to the lack of fossil evidence suggesting group hunting, it was most likely a solitary hunter. How it fared against other dinosaurs who did hunt and exist in packs is an interesting question. Some have said the T. Rex possessed such a powerful bite that this alone would have been a huge deterrant and factor in maintaining its superiority over other large dinosaurs and pack hunters. It’s absolutely certain that the Tyrannosaurus would have eaten large dinosaurs if they were already dead but may also have attacked animals that were either too young, sick or old to protect themselves. Some scientists believe this behaviour is scavenger like whilst others feel it’s just a fact of life. In terms of what and who it preyed upon, there’s fossil evidence to suggest it commonly consumed both Triceratops and the duck-billed Hadrosaurs such as the Corythosaurus. In most cases scientists feel that an initial power bite would have severely crippled its prey causing massive blood loss. This would eventually cause its prey to lose strength and even collapse. At this point the T. Rex could quickly use both its foot claws and mouth to finish off its opponent. In total around 30 Tyrannosaurus Rex fossils have been recovered with the first T. Rex fossil being discovered in 1902 by Barnum Brown in South Eastern Montana, USA. Most other T-Rex fossils were also found in this region but some have also been found in Canada and parts of Asia such as Mongolia.